Have you ever read a description of a scientific experiment and wished that you could visualize how it’s performed? Now you can! UAlberta Libraries subscribes to the complete contents of JoVE, a peer-reviewed scientific journal that publishes experimental methods in video format. 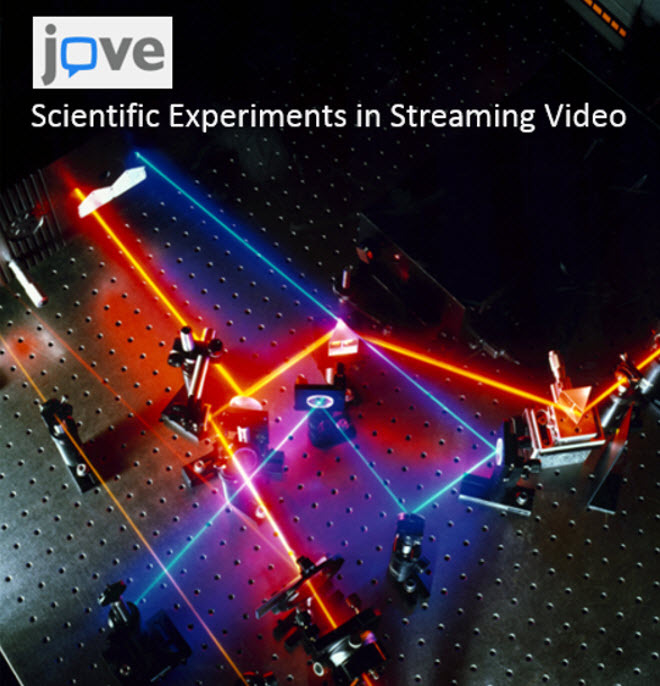 Launched ten years ago as the Journal of Visualized Experiments, JoVE has published over 7,000 high-quality videos demonstrating experiments from laboratories at the world’s leading research institutions, including the University of Alberta. JoVE Video Journal contains cutting-edge experiments, accompanied by detailed text protocols. Collections include Biology, Developmental Biology, Genetics, Neuroscience, Medicine, Cancer Research, Immunology and Infection, Chemistry, Biochemistry, Engineering, Bioengineering, Behaviour, and Environment. JoVE Science Education videos allow educators and students to better teach and learn key concepts and fundamental techniques at the undergraduate course level. These simple, easy-to-understand video demonstrations cover a wide range of STEM subjects including Biology, Chemistry, Environmental Science, Psychology, Clinical Medicine and Engineering. Visit JoVE today for a new perspective on lab experiments.